Elijah: Double Portion by Brenda Wright, contemporary. 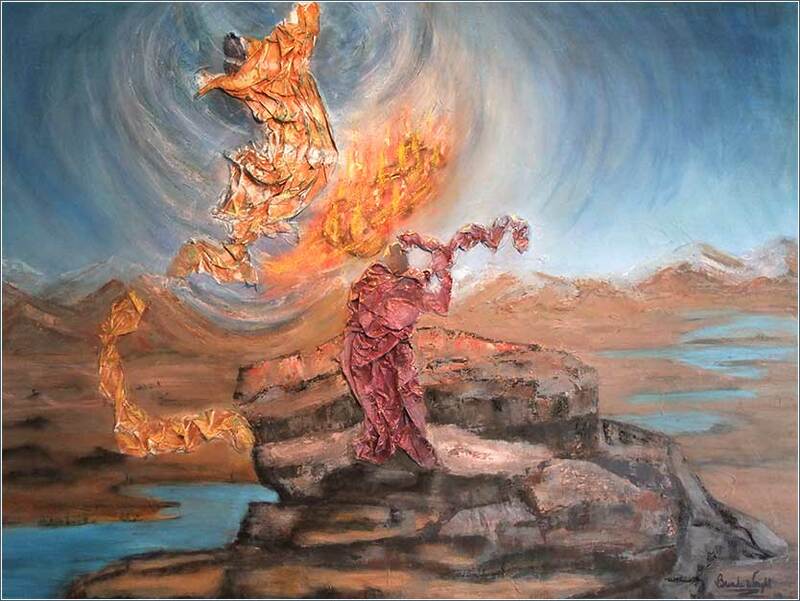 A depiction of Elijah and Elisha, from 2 Kings 2. 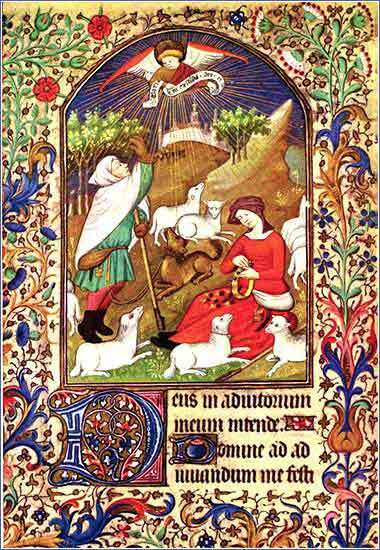 Annunciation and Shepherds from a French Book of Hours (a prayer book), ca. 1425.
. . . cont'd from yesterday. So, it is easy enough to see what Paul means, by being crucified with Christ, being dead, living in Christ and Christ living in him. But what about us? This leads to a central, and quite a difficult, issue in modern Christianity. he teachings of both Paul and Christ appear to call for a radical and almost violent change in the believers' life. A knowledgeable Christian learns to pay at least lip service to such ideas as picking up their cross to follow Jesus, dying and being reborn in the Spirit, dying on the cross with Christ, etc. We put aside the natural human, the life in which we live according to sinful instincts: glorification of self, gratification of physical and emotional needs as our prime goal in life, uninhibited pursuit of the pleasures of the world. There is an enormous tension between following Christ as well as we possibly can, and counting on the forgiveness of our continuing sinfulness. On the one hand, we are dead to the law; we cannot save ourselves by our good works. Only through faith in Christ might we find the forgiveness that we will ultimately need to be united with Him in eternity and be found righteous before God’s judgment. We can be justified only by faith; sola fides, faith alone, has the power to save our souls. The problem is that there are two different ways to read “by faith alone.” First, “only those with faith will be saved”; second, “faith is all one needs for salvation.” People mistakenly hear the second of these, which Martin Luther (and Paul) clearly did not intend, and which is contradicted repeatedly in other parts of the Bible. “Faith alone” means “only by faith,” that is, only those who have faith can find salvation. It does not mean “alone” in the sense of “faith and nothing else.” To say that faith in Christ will save us, no matter how much we continue to sin after this rebirth, is a defined heresy: antinomianism. (If you are Protestant and associate the word “heresy” with Catholicism, substitute “false prophesy” or “perversion of the Gospel”.) We cannot take the attitude that we can sin all we like while praying to Christ for salvation, because He can forgive all sin. That is what “antinomianism” means. This is, to my mind, the most perplexing and disturbing area of Christianity. People do not like to hear about it. But it is the Word of God; so we will keep this issue in mind as we read Paul and remember that “death to the law” does not trivialize morality.